Figure 6. 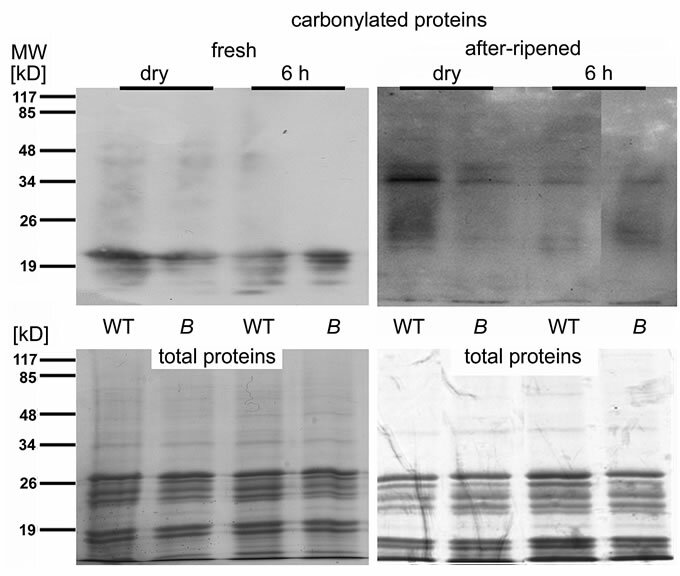 Protein carbonylation is reduced in after-ripened seeds of the atrbohB mutant compared to WT. Immunoblots with antibodies against derivatives of carbonylated (=oxidized) proteins. Protein extracts from dry seeds and seeds after 6 h imbibition of wildtype (WT) and atrbohB (B). The seeds had been grown together and after-ripened in the same location for two years. Below the blot, a Coomassie-stain is shown as a loading control. The majority of the stained proteins most likely correspond to the very abundant globulin storage protein. MW, apparent molecular mass in kD.